Is there a better way? This is close, and it will probably quilt out, but I spent waaaay to much time on getting this piping mitered. I never have "regular" mitering issues, but that piping kept getting in the way. 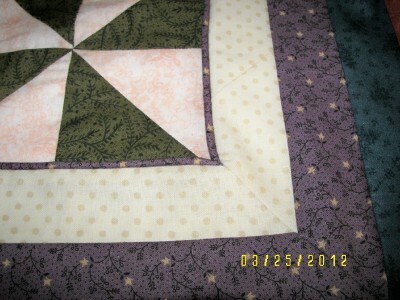 This piping is sewn to the border strip, not the quilt top. Perhaps I just wasn't neat enough? Should I remove some of the cording out of the piping in the last 3/4 inch? I am a terrible "I'll do-it-myself" person (stubborn, I know) and should have sought help before struggling for more than an hour on just one miter. Taking the cording out about and inch before the miter sounds like it might help. That is about the extent of the help I might lend. I'll be watching as I'd like to learn from your experience. from what I remember in dressmaking, you do not miter piping. instead, you put one side down with the cord removed 1/4 inch above the seam line, then run the next line overtop it. I've only used piping on a couple quilts but I sewed it to the quilt not the border. I'm looking forward to learning with you! Please share your solution when you find it. I like your blog. Elaine, I would be inclined to try sewing the piping to the quilt top, then miter just the border. However, Lynn's suggestion makes sense, so maybe that is the way to go. I'm learning along with you! Be sure to let us know what works! Could you do it the way you add piping to a pillow? Lay the piping on the edge of the center, piping on the inside and matching the edges of the piping flange and the quilt center. Sew the piping to the center, clipping the piping flange at the corner and turning the corner without stopping the piping. If the casing of the piping is on the bias, it should bend into that 90 degree inner angle pretty neatly without a lot of bunching. Then add the borders (I would NOT try to miter them, mostly because miters make me crazy and unless they are something like a border print, who really sees the miter anyway). Use your zipper foot to sew the first border onto the top with the piping so you can get close to the cording. At least that's how I would try it. Pinwheels and 4-Patches, My Second!